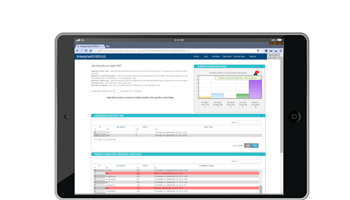 EnterpriseSCHEDULE lets you graphically control, administer and monitor complex job streams for Windows, AIX, HP-UX, Solaris, OpenVMS and Linux platforms. A heterogeneous distributed production environment allows consistency to be maintained throughout a company's enterprise. Graphically define complex job streams using conditional parameters such as file and/or resource dependencies and job interdependencies. Advanced workgroup features allow the fine tuning of distributed processing across the enterprise. The software fully integrates across platforms through the use of a common data format. The controlling server is able to manage all job activity to the high standards ISE customers have grown to expect, regardless of platform. Each version of the client was engineered with the user in mind with a consistent user interface that requires virtually no cross training when migrating from one platform to another. So whether you’re a Windows, OpenVMS, HP-UX, AIX, Solaris or Linux user, you’ll find EnterpriseSCHEDULE to be the most complete and powerful job scheduling system there is. Read more about the system and take a look at our FAQ’s, documentation, and customer success stories. Then give us a call so we can set up a free demo and walk through to see the many features that makes Enterprise SCHEDULE the leader in the field. Contact us for a free 45 day evaluation today! All ISE software is available for a trial demo period so you can try out all the features at your own pace. To request a full featured demo of this or other ISE software, go to the download page. Technical personel are available to help you download, install and demo the software. Advanced calendars allow selective scheduling based on a marked calendar. Named day scheduling allows the processing of jobs on particular days of the week at a certain time. Interval scheduling allows jobs to be processed at a selected interval. Job processes can run concurrently, in a stream or based on resource status. Job runs can be based process previous job events, resource status, scheduled events, manual submission and variable status. 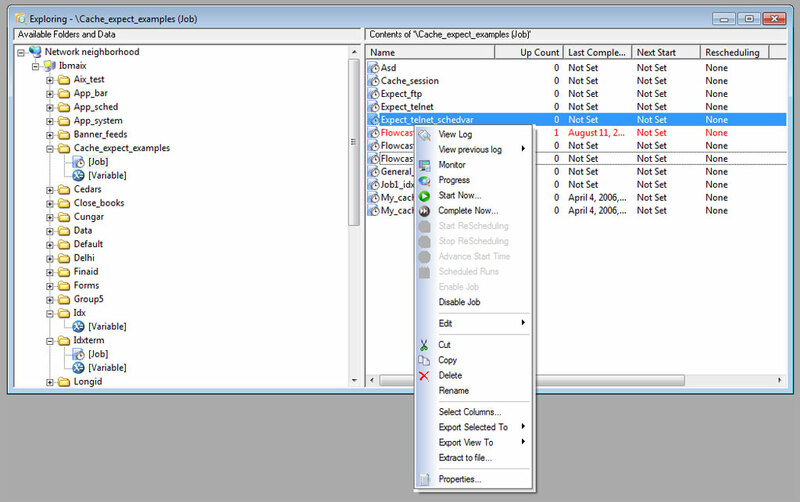 Job runs can be based on the creation or modification of a file. 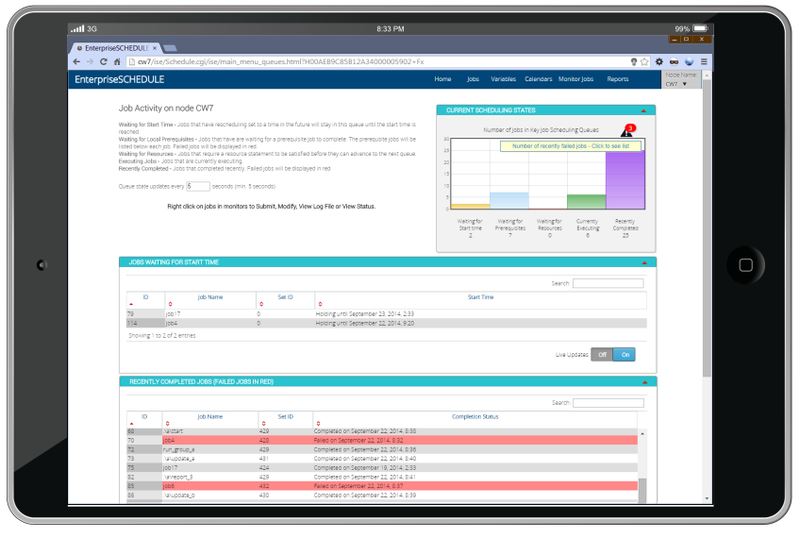 ISE is extending the boundaries of automated job scheduling with the preeminent scheduler for Windows, OpenVMS, HP-UX, AIX, Solaris and Linux. Each platform incorporates ISE's unparalleled reputation in the management and automated scheduling of vast quantities of interdependent tasks. This, along with unmatched support and the experience of more than 25 years in the business, comprise a scheduling package you won't want to live without. In today's dynamic environments, where thousands of tasks are processed 24 hours a day, 365 days a year, EnterpriseSCHEDULE is the job scheduler of choice. 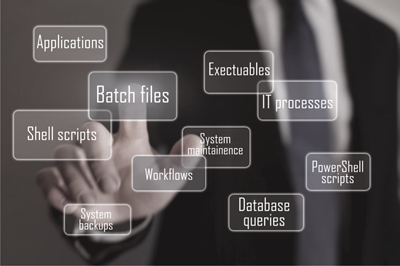 While most scheduling software runs on only one platform, EnterpriseSCHEDULE is the scheduler that spans the widest spectrum, with OpenVMS, Linux, HP-UX, AIX, Solaris, Windows and Linux versions that fully integrate with each other through the use of a common data format. In fact, ISE has made each version of the client so similar in functionality, there's virtually no learning curve in migrating from one platform to another. This unparalleled capability allows consistency to be maintained throughout a company's enterprise, reducing or eliminating the learning curve required in mastering an advanced job scheduler on multiple platforms. The software fully integrates across platforms through the use of a common data format. The controlling server is able to manage all job activity to the high standards ISE customers have grown to expect, regardless of platform. This includes a wide range of time based, resource dependent and variable scheduling options that add unmatched versatility and simplicity to your jobs. EnterpriseSCHEDULE is a job scheduling solution that initiates, monitors and tracks job activity on OpenVMS, Windows, AIX, Solaris, Linux and HP-UX platforms. The database can be distributed over the entire network, eliminating any single point of failure. Job processing can be executed locally on individual nodes or distributed across any combination of these platforms from a central server. Jobs can be scheduled at any interval, on a named day basis or using a calendar with marks for run days. The software fully integrates across platforms through the use of a common data format. Each version of the client was engineered with the user in mind with a consistent user interface that requires virtually no cross training when migrating from one platform to another. Applications can be developed into highly reliable `fault tolerant' job sets, ideally suited to the emerging trend for `lights out' operations and `hands off' solutions. EnterpriseSCHEDULE eliminates the need for regular operator attendance and effectively makes these applications self correcting. It does so by taking remedial action automatically when a fault occurs and running jobs through to their termination. With thousands of critical tasks on the line, system reliability is integral to data center operations. Companies can be assured of 24 x 365 resilience with the hot-swap capabilities; multi-site, disaster-tolerant clusters; and dynamic server resource reallocation of OpenVMS on AlphaServer and Itanium systems. EnterpriseSCHEDULE also works continuously without any resets, so cluster rollover capabilities are automatically available in the system. In todays dynamic business climate, companies need an affordable system now that can accommodate their future growth requirements. EnterpriseSCHEDULE is highly scalable, accommodating unpredictable and massive growth. EnterpriseSCHEDULE utilizes today's dynamic processor allocation features via automatic scheduling to meet the job load. In the meantime, the quantity of automated jobs can scale right along with a system as it expands. 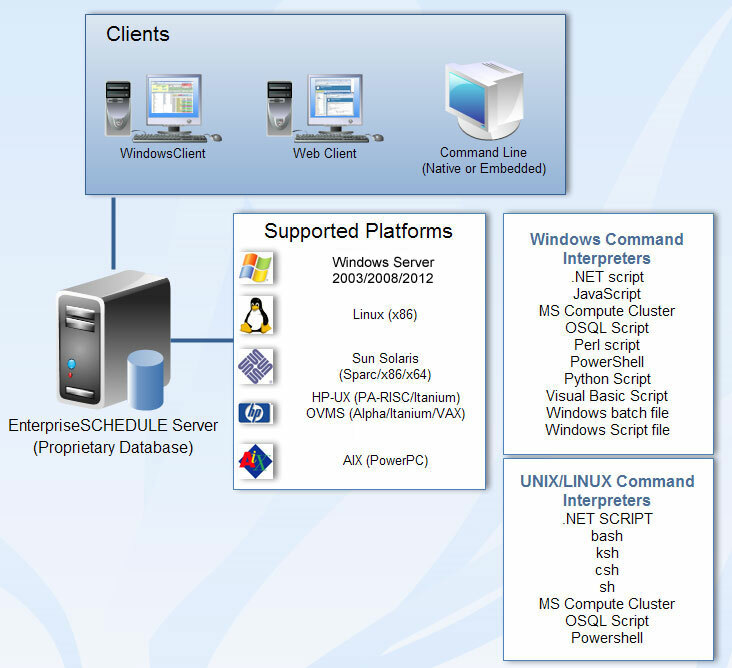 EnterpriseSCHEDULE spans operating platforms, including the Windows, Solaris, OpenVMS, AIX, HP-UX and Linux operating systems. Jobs and processes can be created on and these diverse systems and the data they generate and control can be completely integrated throughout the enterprise. EnterpriseSCHEDULE jobsets have been customized for a wide range of application packages for everything from financial to educational institutions. Jobs can be customized to perform tasks that normally require user input. In addition, you achieve the ability to integrate your application jobs into business workflows that involve applications on different platforms. Cross-system dependencies can be attached to native OS jobs. The results are greater productivity and reliability, with reduced implementation and operations costs. Two level folders similar to Windows folder system. Jobs are stored in folders. The look and feel resemble the native Windows file system, but the EnterpriseSCHEDULE contents actually reside in a database. This database supports 2 levels of folders. 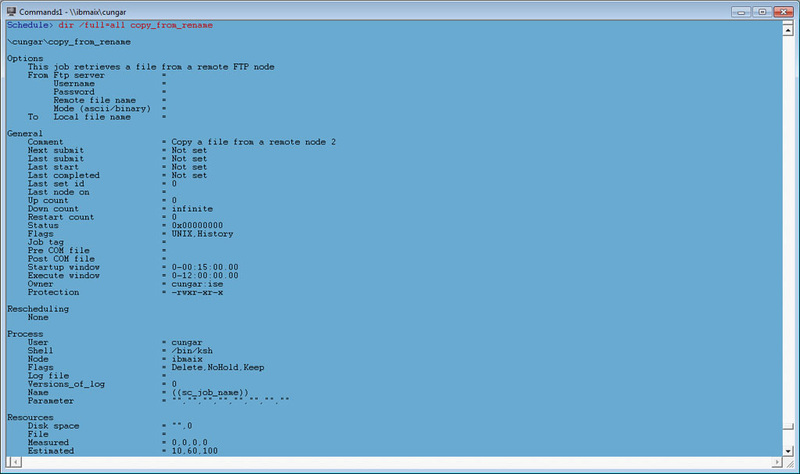 Additional command interpreters may be added manually. Enterprise job scheduling has become a vital part of today’s enterprises both large and small . It has become an essential tool to perform the many automated processes that IT managers are responsible for. EnterpriseSCHEDULE is the preeminent Enterprise wide job scheduler on Windows, OpenVMS, Linux, HP-UX, Sun Solaris and AIX and is backed by more than 25 years of experience in the field. Explorer view allows Windows style administration of jobs, calendars, etc. Optimizes automated processing allowing more work to be accomplished without intervention. Implements simple or complex job streams based on the successful completion of other jobs or resource (file or hardware) requirements. Distributes the database around a cluster or across a network and systematically configured as needed. 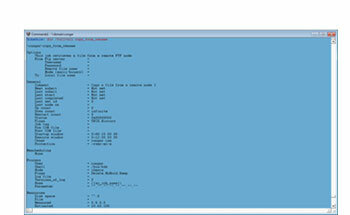 Selectively deliver exception messages to a pager, an e-mail system or as a pop up message in the Windows interface. Because the EnterpriseSCHEDULE system is diverse across a full spectrum of platforms, it saves time and money in purchase time, reduction in maintenence costs and the need for additional servers. 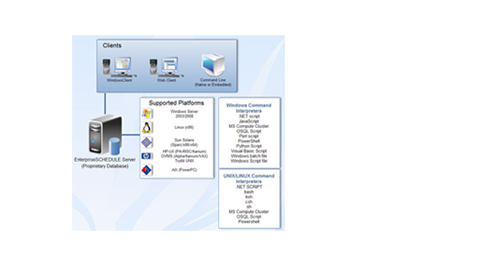 The Windows Client connects seamlessly to any EnterpriseSCHEDULE server whether it be Windows, Open VMS, UNIX, HP-UX, Solaris or Linux making it easier than ever to control, modify and monitor job activity from a central Windows client. The EnterpriseSCHEDULE for Windows Explorer provides a familiar interface when working with jobs, scheduling calendars, programming variables and other objects used within EnterpriseSCHEDULE. Objects may be dragged and dropped between folders, between servers on other nodes, across platforms and into the Layout Display. 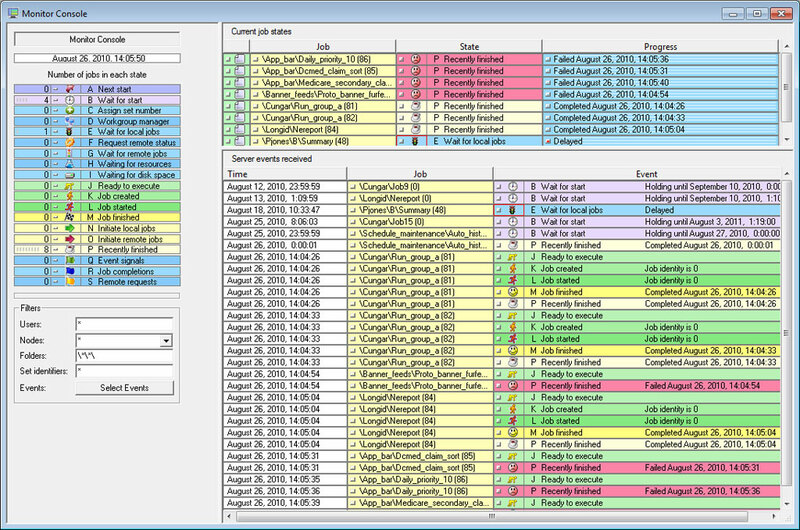 Jobs and other objects may be modified within the Explorer, copied to other folders, deleted, renamed and many other functions. It’s never been easier to control, modify and monitor job activity in a single window with the introduction of the EnterpriseSCHEDULE for Windows job Layout. Jobs appear as colorful boxes in a point and click display that can be used to create simple job runs or elaborate job streams containing hundreds of jobs. Jobs can be created in the layout, their properties modified and updated, submitted for execution or stopped and restarted if neccesary. 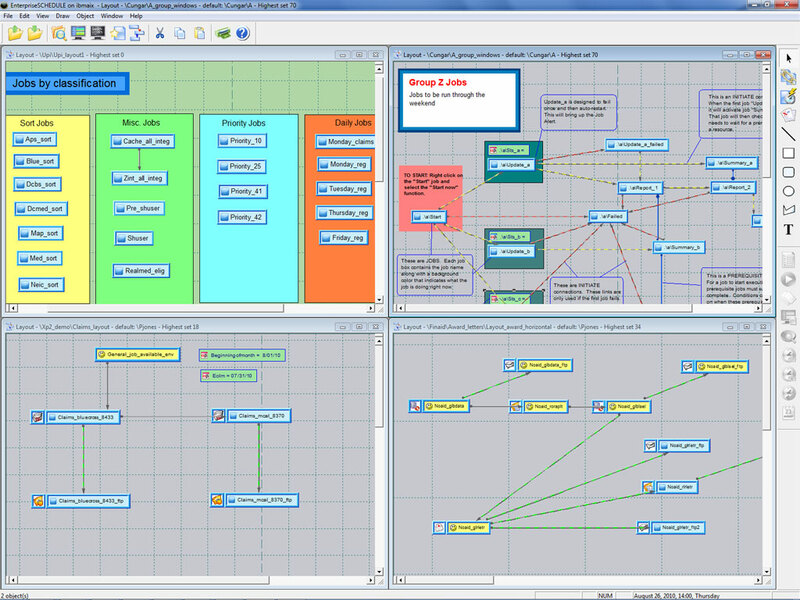 Job dependencies (the connections between jobs) can be created, modified and updated. What’s more, the Layout display monitors job progress through the stream as jobs advance through their normal course. Colorful icons indicate changes in state such as ”job starting” and "job completing successfully”. Job delays can be researched with “current state” display. Monitoring job activity has never been easier or more informative than in EnterpriseSCHEDULE. Job Activity can be monitored from a variety of levels within the monitor window. As jobs progress through their critical states, the Job monitor window shows you the state of that particular job, how many resources that are being consumed and whether the job is experiencing delays, holds or failures. You can bring up the job status in a separate window and monitor a graphical view of its activity. The State Monitor Window gives you a picture of what jobs are in a particular state. For instance if you notice a lot of jobs in the “Waiting for Resources” state, it may trigger you to check the availability of the resources. Job states such as “Waiting to start” and “Completed successfully” can also be monitored to get an overall picture of job activity. The Event Monitor is a complete picture of activity, past and present within a predetermined time frame. The list of events displays vital history of recent events to get an overall up to the minute view of job progress. The newly updated Web/Mobile Client adds mobile connectivity to the EnterpriseSCHEDULE suite of client interfaces. 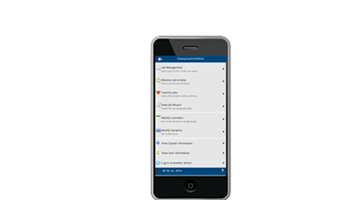 Now you can perform scheduling and monitoring tasks from any mobile device. The EnterpriseSCHEDULE Web Client lets you maintain and modify job configurations, submit and monitor job activity from a browser or mobile device. The Web Client is installed on a Windows IIS server and can access any Windows server on your network regardless of platform. The web interface provides remote management of EnterpriseSCHEDULE servers. View job status, reports, event logs and trigger jobs on remote computers. Monitor status of job events like Job Failures, job submissions and Job Completions. The EnterpriseSCHEDULE Web Client fully supports modern Tablets allowing you to do all vital Job Scheduling and Monitoring on a tablet. The Web Client adapts to Smartphone dimensions with an easy to view interface specifically designed for the small screen. 2) a prerequisite that holds up other jobs until completion. Identifying dependencies and making connections between tasks and processes, whether within the same cluster or across an entire enterprise-wide network that includes multiple platforms, turns complex scenarios into manageable processing streams. Conditional progression of job streams can be accomplished through programmable resources that determine execution of tasks based on variable status, completion status, resource states and a variety of other factors. 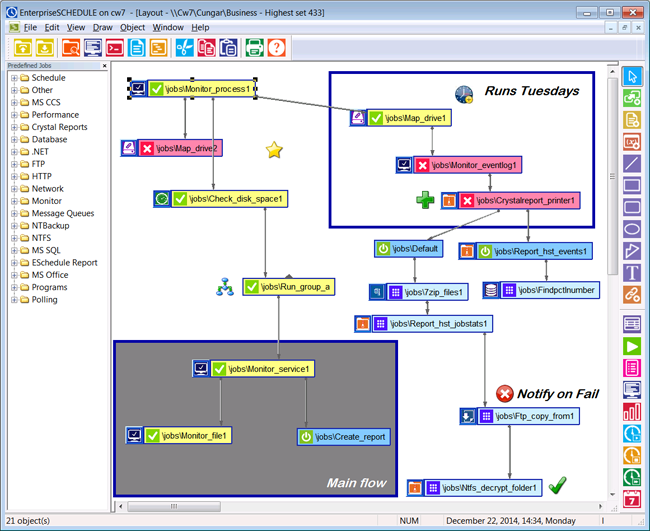 EnterpriseSCHEDULE gives you more control of your job flow with fully programmable resources. Using this powerful feature, you can add crucial decision points that allow you to control execution based on variable evaluation. With the built in conventional programming tools, a job stream can be based on a wide variety of algorithms. Job streams can be simple or complex and can evaluate the availability of system resources. These streams, which are viewable in a live display, are automated and optionally redundant making them both interdependent and user controlled. Job progress is monitored through a series of states representing important events in a jobs execution. Notification of events can be sent via pager, email or pop up window. 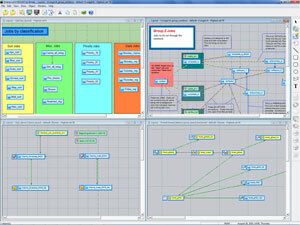 The EnterpriseSCHEDULE database is embedded, independent and contains all jobs, calendars, layouts, variables etc. There is no need for a third party database. The EnterpriseSCHEDULE database is organized to keep jobs, calendar definitions, variables and other data in an object oriented fashion that makes accessing and modifying data easier. 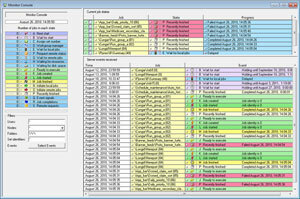 All objects are organized in easy to access directories (folders in Windows) that classify all objects by type. In the Windows Explorer, all objects are subcategorized in a folder according to type. Jobs can be stored by category, job stream or whatever means desired. Distributed or centralized support means the EnterpriseSCHEDULE database can be configured across a network of systems either as a centralized network with satellites or as a group of peer-to-peer databases. The entire EnterpriseSCHEDULE database is organized into directories. Any number of directories can be created. Any number of concurrent users can use the system. Access to the job database is controlled from platform-dependent security methods and platform spanning ACLs. EnterpriseSCHEDULE features a cooperative architecture through heterogeneous or homogeneous servers talking to each other. This distributes processing and is extremely fault tolerant (no single point of failure as in Master/Agent architecture). 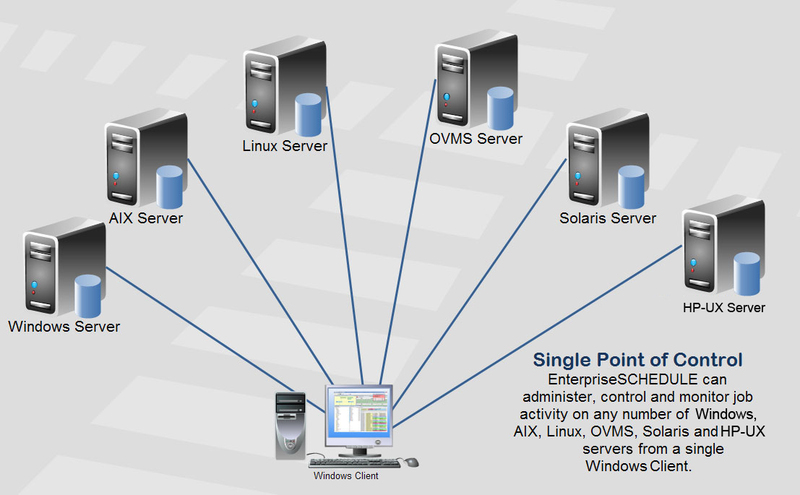 The client/server architecture allows you to add additional machines to your enterprise while easily managing them from one central client. 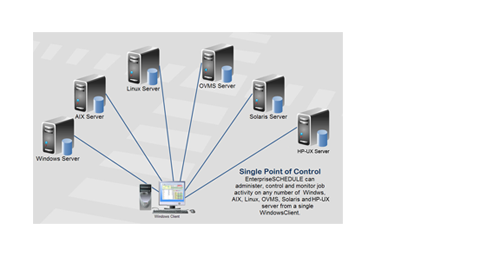 Using the Windows Client, any number of servers can be connected to in a single or multiple desktop sessions. EnterpriseSCHEDULE has a variety of client and scripting options to fit even the most diverse enterprise.